"I wish I had known Dr. Bahar a long time ago. Talk about Painless dentistry!" "Thank you so much for keeping me relaxed and pain free during my filling today!" "Amazing, painless and a fantastic bedside manner. Keep up the great work Dr. Bahar." "I've heard about your work and the satisfied clients, wish I was living closer." "I trust my teeth in this doctors hands!" "I'm very anxious when it comes to dental visits and they were very caring and attentive." "I like that Dr. Bahar provides guidance, when explaining a dental procedure." With locations in Scottsdale and Cave Creek, Arizona, the communities north and east of Phoenix have access to compassionate and expert care at Dentistry at Grayhawk. Led by husband-and-wife team Drs. 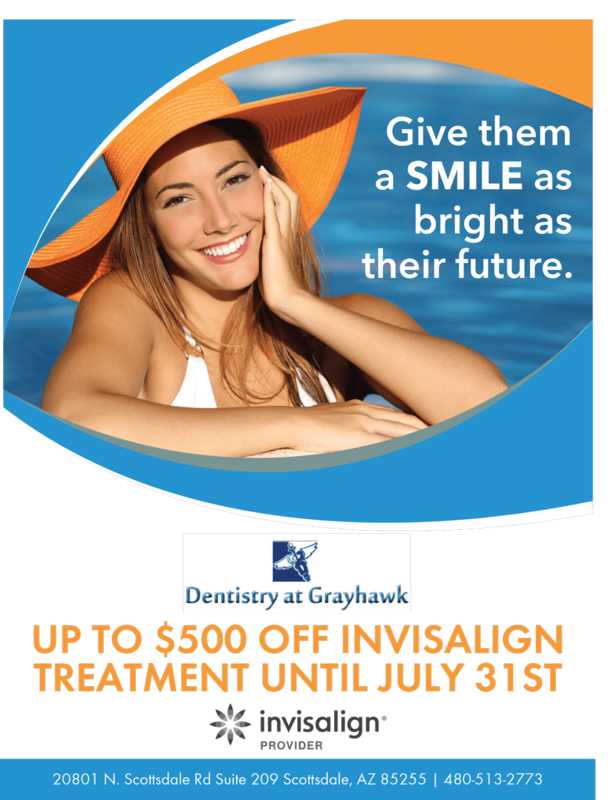 Bahar Ata-Abadi and Kamran Ata-Abadi, Dentistry at Grayhawk provides a wide range of services to keep teeth healthy and beautiful, including Invisalign®, ZOOM! whitening treatments, veneers, and more. Patients of all ages are welcome, and specialized pediatric dental care is available for younger patients. The team at Dentistry at Grayhawk creates a warm, family-friendly environment where patients not only receive compassionate and gentle dental care but also benefit from state-of-the-art dental equipment and best practices. Drs. Ata-Abadi invest in the most advanced technology available today, including laser therapy, digital radiography, electronic health records, and trusted dental brands like Invisalign and Straumann® dental implants. Patients can rely on the Dentistry at Grayhawk team always putting their dental health and well-being first. New patients are welcome at both locations, and most major forms of insurance are accepted. Families from in and around Scottsdale and Cave Creek can call either office or schedule appointments online today. Our office is in-network with most PPO plans and accepts several discount plans. In addition, we offer reduced fees to patients who do not have dental insurance. "I'm so glad to be back with Dr. Bahar Ata-Abadi and Dr. Kamran Ata-Abadi. I've been gone for four years and they treated me like family." "After I met Dr. Bahar I now feel comfortable with dental work. The entire staff always goes above and beyond to make my experience as pleasant as possible." "The dentists are both very professional and thorough. I know they work hard to ensure my entire mouth and overall health is well taken care of." "I'm so happy that our good friend Seela referred me to Dentistry at Grayhawk. Best dentists ever!!!!!" "I now have the Hollywood smile I always wanted! It's movie time!" The staff is very friendly especially the receptionist. Always love chatting with her while my kids are getting treated. Very comfortable and clean office. Great experience I'm switching over to Dove Valley. I've been a patient about 10 years. I really appreciate Dr. Cameron. Everyone at this office is very personable and professional. Everything is explained fully. Thank you for providing such great care!!!! I can't praise this dental practice enough; they're the best. Dr. Bahar is professional, personable and proficient & very caring when it comes to taking care of patients.